Choosing the best body pillow may seem like a daunting task, but it doesn't have to be. Navigating a path to finding the right pillow is simple once you learn how to get started. These are a few tips about what you should be looking for, some of the products available on the market, and all of the information needed in between. Before jumping into buying a body pillow, you will need to be confident with why you need one. Are you pregnant or perhaps suffering from chronic back pain? There are several different ailments that can be addressed by finding the best pillow. Identifying what type of sleeper you are is also going to be a huge help when picking out the right product. Knowing whether you sleep on your back, side, or stomach is the best place to start. Once you identify your preference, you can begin your search for the best pillow. Various people of all ages use body pillows for several reasons. If you are buying it for yourself this will be easier but if you are buying for a loved one, it may be a little more difficult. There are several different sizes and shapes available, so be thorough in your research. You will need to decide what size body pillow is ideal for you. There are longer ones, medium ones, and short ones. They come in various shapes as well, but that will be addressed once you know the size that is perfect for you. There are two main shapes of body pillows. The “U” shape and the “C” shape are both good options, but you need to decide which will work best for you. Where do you need the most support, and which shape will provide that? The “C” shape is for someone who won't mind having several places touched by the pillow. You could place it between your knees, have it support your back, and then also use it for your neck. This particular shape is ideal for people who sleep on their sides. The “U” shape is ideal for back sleepers. You will be able to sleep with this wrapped around you, but it generally is used to support your neck and upper body. Sleeping can be a little difficult to get used to, but the benefits of lessened pain may be worth it. Be sure you are asking questions or researching the materials these body pillows are made from. You want to be able to have a lasting body pillow, not one that will break down in a few weeks or month. The type of material used is important, especially when it comes to durability. Pillows can be a fickle thing. You should check out your warranty options and choose what will best fit your needs. Usually there are specifications about what will be covered and what will not be, so prepare to keep your body pillow protected with an extra case. When you are looking for the a good body pillow, you should also be considering protection measures. Spending money on this is an investment in your health, and it should be taken seriously. You don't have to spend a ton of money, but you should make sure it will help the ailment you are struggling with. Once you have decided what your needs and wants are, you can begin searching for the best fit for your life. This body pillow is one of the better options if you are looking for a classic “C” shape. Whether you are pregnant or just experiencing back or neck issues, this will give your body the support it needs to help alleviate some of the pressure you have been feeling from a long day or a rough night of sleep. It is soft, feeling almost like a t-shirt. This is a great feature because the more comfortable the pillow is, the better sleep you will be getting when using it. It is recommended to have the pillow around your back, as that is the most comfortable position. If you are a side sleeper who rolls on your back halfway through the night, this will help to stop that. The body pillow will conform to your body, thus blocking you from being able to roll over. It helps to keep your body in line as well. This product offers the “U” shape option for back sleepers, but can also benefit side sleepers who turn into back sleepers once they have fallen asleep. It is rather large, so you may need to consider space ratio on your bed. You will be able to use it for a few different things. Sleeping is obviously one of them, but you can also use it for support while reading in bed or just laying down and watching television. When you are purchasing this pillow, you need to check what type of stuffing is in the pillow. There are two types being sold, one that will need to be fluffed more than the other. Fusion Fiberfill is what is typically used in these types of pillows, but it flattens way easier that Fossfill. Fossfill is highly recommended and if given the choice, the latter option is the best. This body pillow may be just what you have been looking for. It is simply made, and doesn't come in the form of a letter. Just a long pillow ready to help you kick the pain of sleeping once and for all. There are several lengths you can order to fit your height accordingly, but the selections aren't there for the taller people. 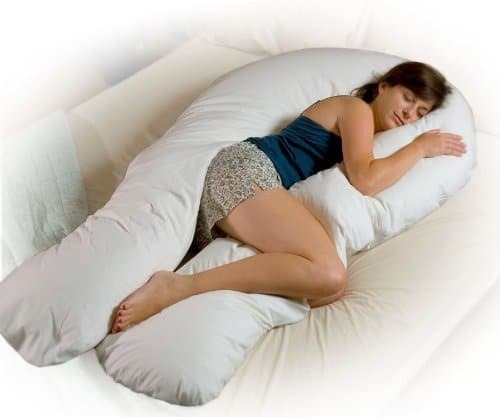 This body pillow was one of the original ones on the market, and is still around today. That speaks volumes about it, and the fact that it offers various heights adds to that. Usually when you buy something like a body pillow you don't expect it to smell. Because it is made out of kapok, there may be a slight odor. Once you have the pillow dry-cleaned or wash it yourself, the smell should be gone for good. If you are looking for a pillow on the more firm side, this may be a good option. The pillow itself is firm but will conform to your needs without going too flat. This is one of the better features of the product. 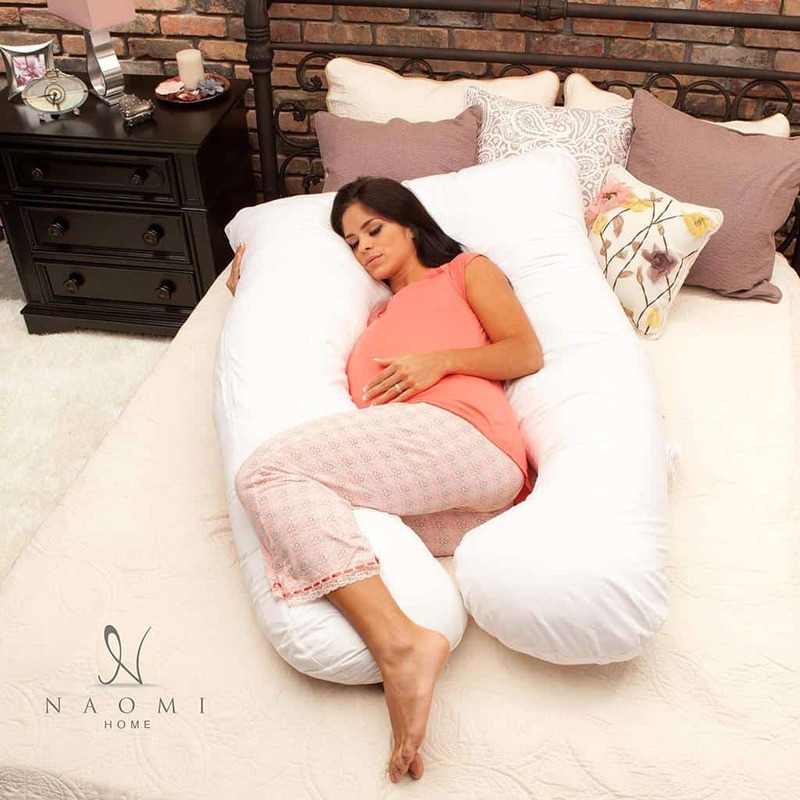 This is a “U” shape pillow, but one of the better options. It will be most beneficial if you are pregnant or have aches in your neck or back. Some with other ailments have used this, but it is recommended for minor issues not something significant. A body pillow isn't something you necessarily believe to be a space hog, but this one is rather big. It is recommended you use it on a queen bed or bigger if you want to sleep with your partner. If you are okay being in bed alone, any size will do. The cover is easily removable, and it should be washed before being used. It will come with the “new” smell and sometimes that can be overwhelming. The removal and replacement process is simple and can be done with only one person and very little effort. This definitely a body pillow that will appeal to the younger generation. If you are searching for something a teen or youth would use, this may be an option you want to explore more. It is squishy and fun, plus it comes in some neat colors. It is stuffed with microbeads, so it doesn't have the same feel a “normal” pillow would. If you are someone who prefers fluff inside of your pillows, this may not be the ideal fit for you. The bonus of using microbeads is that they allow the pillow to conform to you and bounce back without much effort. If you have hip or lower back issues, this shape is definitely something you should consider. This body pillow is long, and it allows you to sleep while hugging it. There isn't anything you can get tangled in, which is a plus for people who get up multiple times a night for various reasons.